We met one of Nikki's nurses last night. She was a lot like Kristin Wiig's character, Penelope, on SNL … you know the one that always has to one-up everyone? 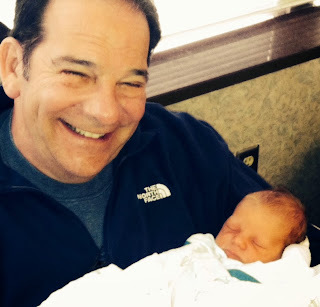 Nikki (to me): "Dad … now drive safely going home …"
Nurse (interrupting): "Where are you going?" Me: "Um … St. Pete …"
Nurse : "I've been to St. Pete, many times …"
Me: "That's nice. 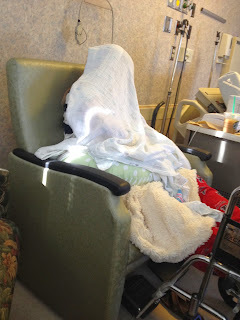 Now Nikki …"
Nurse: "Got a sister who lives in Brandon and a niece in Tampa …"
Me: "I see … Steven, are your parents coming …"
Nurse: "I was at Tampa General …"
Me: "Oh really … me too …"
Nikki put the blanket over her head. I wish I had the blanket after the nurse started her next round of Penelope-isms. Okay, full disclosure … it wasn't for Penelope … it was for when she finished breastfeeding. Anyway … this morning we picked up breakfast at Atlanta Bread Company. I ordered four egg and cheese sandwiches on sesame bagels for Nikki. Steven, Debbie and me. 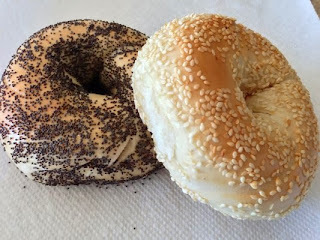 The server asked, "What kind of sesame bagel? We have two types." "Two types? Really? I didn't know there were two types. " "Yes," she said. "One has white seeds and one is black." The other server interrupted her and announced that the black one is poppyseed. I said, "I'll take the white." She was punching in the order on the cash register (which took about 10 minutes) when she suddenly stopped and asked, "Would you like cheese on that?" "On my egg and cheese sandwiches? Yes, I would." She said, "Okay … Good." After breakfast, we said a sad goodbye and headed home. We stopped at a gas station to fill up. Inside we gathered important food items for the road … cookies, chips, nuts … healthy stuff. We had a hard time getting to the register because huddled in front of a television screen on the wall were about four people intent on watching the "show". When we got close enough to see what was on … we realized it was the security monitor of the outside gas pumps at the station … THERE WAS NO ONE IN FRONT OF THE CAMERAS. I'm glad we made the trip. We got to meet some of Savannah's finest citizens. But … of course the best of the best was my new little grandson … Cole Benjamin Cohen. Can't wait to come back … soon. HA HA! I loved the Penelope character but she would be so annoying to actually meet. That's so funny. Beautiful pic of you and Cole!